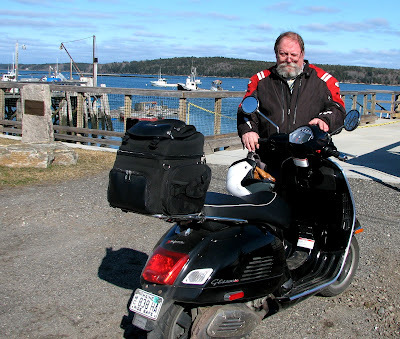 Here I am, standing proudly with my one-year-old Vespa GTS 250 i.e. Super, on the day the marvelous machine and I celebrated one year as a team. 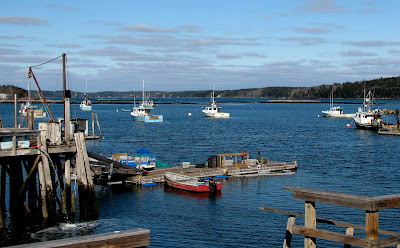 In that year, riding nearly every day, in every month, we shared 8704 miles on Maine's highways and backroads. I am 63 years old, and have made a lot of poor decisions in that time - but buying this scooter was without question the best purchase I've ever made (Best overall decision was asking Kathy to marry me 37 years ago). 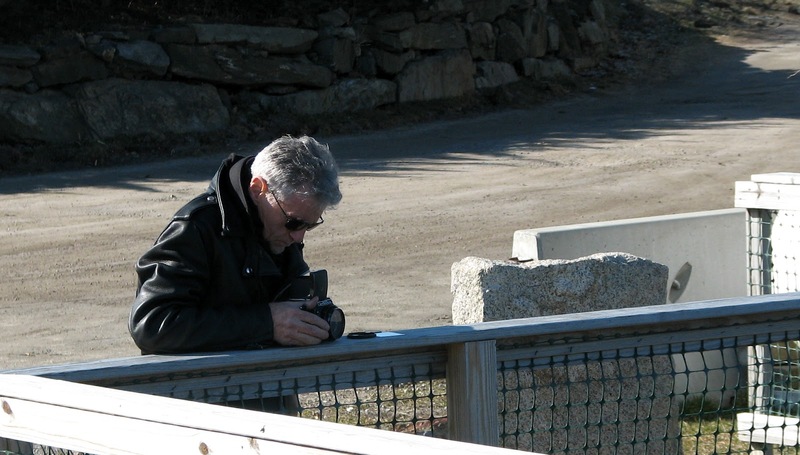 Mike T. of http://scooterthefun.blogspot.com/ is using a real camera, with actual film, to record the beauty of Cundy's Harbor. Cool as the new digital stuff is, there's nothing like film. It's like the difference between vinyl and a CD or mp3: close, maybe - but a tad too different for my taste. Everything is ready for the summer tourists, including the picnic tables. We like to keep them stacked up so the summer people will go away, but most of them figure out how to get them down. Summer pest: "Room Service? Please send up a towel." Mainer: "You'll have to wait - someone else is using it." I'll be 60 this coming June and this is my third season commuting. I agree wholeheartedly with you, riding my Vespa to and from work is a true source of happiness. 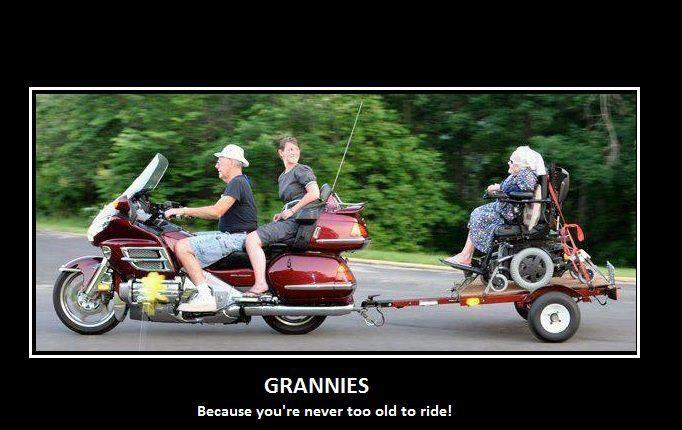 Even more delightful than scooting to work is being retired and scooting to - wherever! My mother's folks were Swedes; some married Danes and Finns - and one married a Norwegian! No subtlety in our family gatherings. You're correct - Downeaster's - as opposed to southern Mainer's - are blunt. Those in the south, especially the newly planted, are loud louts who we don't listen to much. Tom, congratulations on the milestone! Most blogs die after a few posts, and I read somewhere that something like 98% of blogs on the Web have had no page views at all. You're doing way better than the average... keep up the good work! I thank you very much for your comments. This new world of scooting and blogging is having a large and dramatic influence on my life. I have been able to retire largely because of the wisdom of my parents (save, save, save), my low-maintenance lifestyle, and the grace of my dear wife Kathy. As to weather - I packed away my winter stuff when we had 10 days of temps in the 70s and 80s. Now we're in a stretch of highs in the low 40s. I refuse to admit that I was wrong, so my recent rides have been brisk and brief. I add my congratulations on your anniversary. I, too, believe buying a scooter was a watershed in my life. Many have pointed out that my life is B.S., but they are only partly correct. My life has been made up of two eras. There was the B.S. part, but then I bought the scooter. Now everything is recorded in time After Scooter, rather than Before Scooter. Ride on, and keep the post coming. I'd miss them if they stopped. I really would, for true, no B.S. Thank you - time and the miles fly by when we're having fun! and then there are the Germans (like me)and we are third down the line and then the Belgians (shame that everyone picks on the Belgians). A few Dutch sprinkled in (like me, again). It makes for a lively mix with those unsubtle moments! I don't doubt your family gatherings are lively! Thanks for your blog. I too am blissfully retired and finally have more time to read and write, but I also want to be outside. The Vespa GTV 300 came to my attention and I have decided that I am going to make the plunge. Your blog has renewed my resolve! I'm pleased to be part of getting a fellow retiree out on two wheels. So many of my peers have given up; one guy I went to high school with is in assisted living! And frankly, without the Vespa, I'd probably be stuck at home. I hope you'll post your rides on Mind Droppings, and please visit here often.